The Golf Accessory Bag/Greenside Towel/Brush Set is a unique gift package for players of all levels. The golf accessory bag has 2 zippered pockets perfect for tees, balls, ball markers and a cell phone. 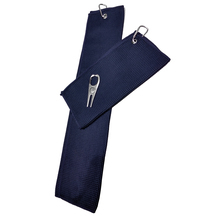 The removable ultra-absorbent microfiber towel is great for wiping down golf grips, clubs and balls. The double sided brush has nylon & metal bristles for cleaning clubs and balls. Black accessory bag is available with Black, Navy Blue or Grey towel. 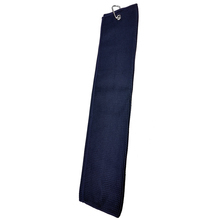 This is a great golf accessories bag, towel and brush by CaddyDaddy Golf! I never actually had an accessories bag before and this one seems like it will be perfect for me. It is nylon and everything can be snapped into place so that it is right where you need it. The brush is double-sided and the pouch can hold tees and such. It would make a nice gift for any avid golfer. The pouches help keep tees and other items easily accessible in a position of your choice with the easy clip. The towel can snap on to the pouches and the brush with two types of heads, one wire and the other bristle can be clipped separately or together as needed. 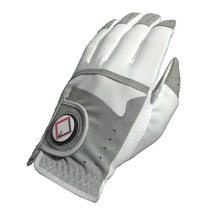 A very handy set for a golfer to keep on his bag and enhance their game. This would make a nice father's day gift - or rather a golfer's day gift. It's a decent set that gives you a small accessory bag, a microfiber towel that snaps onto the bag and a double sided brush with metal bristles that are pretty effective at removing dirt from your club face. The whole setup clips to the outside of your golf bag giving you easy access to the pouch and the cleaning tools. As a set it looks good - there's nothing particularly fancy or showy about it but it has a no fuss design ready to take care of your business on the links.